This is my favorite time of year! I love all of the holiday decorations and pretty lights but my hands down favorite will always be the Xmas trees. For the child in all of us it’s almost like a time machine that transports us back to a carefree time when all was right with the world. There’s no reason to lose that magical holiday spirit but there are still a few “adult” things that we should remember. Unfortunately there are a few inherent dangers that come along with the jolliest of seasons. Every year thousands of homes experience a fire that is caused by faulty holiday lighting or real Xmas trees that are not watered properly. Please keep this in mind this year and make sure that your holidays are not ruined by an unnecessary and completely preventable mishap. Here are 5 very important safety tips that should be followed. Holiday Plants Can Make Your Pets Sick – Yep. Mistletoe and holly are actually dangerous if ingested by our 4 legged friends and can even be lethal. Poinsettia plants are not as toxic but may still cause vomiting and nausea if your pet bites into the branch. It’s best to keep these items out of reach of our furry friends. Careful Where You Hang the Stockings – This may sound silly but a lot of home fires are caused by hanging the stockings too close to a lit fireplace. 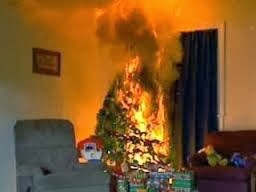 Take care and make certain that you place the stockings a safe distance from the heat and flames. It’s also a bad idea to discard the wrapping paper from opened gifts in the fireplace. Sparks from the burning paper can easily start a fire. Pick the Tree with Care –It is extremely important to make sure that your evergreen is fresh. If the needles are easy to remove and seem “brittle” find another tree. Place the tree a safe distance from fireplaces, radiators and other sources of heat and be sure to keep it watered on a daily basis. Check it from time to time to make sure that it is not becoming too dry. Decorate Safely – You might wonder why I am saying this but believe it or not some tree fires in the home are caused by people using real candles to decorate their tree. As romantic as it may seem, DON’T do it. Electric lights are much safer and just as pretty. If you have small children be sure to place all ornaments out of their reach and check to ensure that they are flame resistant and/or non-combustible. If they don’t have the proper safety labels don’t use them. The Usual Warning About Holiday Lighting – Be sure to use only outdoor rated lights if you plan to decorate the outside of your home. Take the time to check ALL Xmas lights for cracked or brittle wiring before installing them and always turn them off at bedtime or when no one is home. As an added safety measure outdoor lighting should be plugged into GFCI type electrical circuits. Let’s make this the happiest and safest holiday season ever!